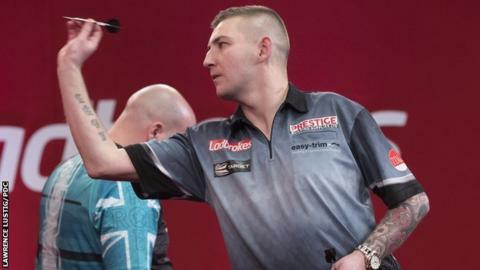 Nathan Aspinall beat former PDC world champion Rob Cross in the UK Open final to win his first major televised title. He clinched victory in style, landing a 170 checkout to secure an 11-5 win over his fellow Englishman. Aspinall, 27, was appearing in his first major final, two months after reaching the last four of the World Championship at Alexandra Palace. Victory in Minehead earned Aspinall a £100,000 first prize and lifted him into the top 16 of the PDC rankings. He described his success as "amazing", recalling that four years earlier he had attended the UK Open as a fan along with his grandfather. Cross, 28, was seeking his first major event win since his World Championship success in January 2018, but conceded he had "nothing left" at the end of the three-day tournament and struggled to find his best form in the final. Peter Wright and Gary Anderson, the previous two UK Open winners, and reigning world champion Michael van Gerwen all crashed out on the first day at Butlin's.